Sosyalist Alternatif (CWI in Turkey) – Originally published at SocialistWorld.net. 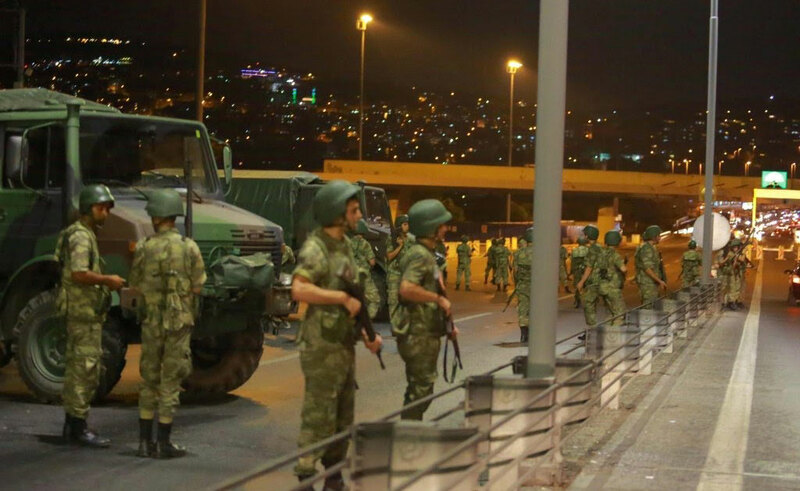 On the night of July15, a section of middle-ranking generals, ex-generals and colonels of the Turkish army tried to seize power by military means and overthrow the AKP government and President Erdogan. At the time of the attempted coup, Erdogan was holidaying on the coast of the Aegean Sea. The military plotters initially managed to seize the National Intelligence Agency in the capital, Ankara, as well as the police academy and police training facility, after fierce aerial bombing. They took control of the airports in Ankara and Istanbul. Despite clashes in other cities across the country, the coup attempt mainly focused on these two important cities. Police headquarters, AKP offices, the mayoral buildings, the central internet server, the two Bosphorus bridges linking up the Asian and European parts of Istanbul were also taken over. The Parliament, where all political parties were in session, was bombed several times by jet fighters, and the Presidential Palace was attacked by military units linked to the plotters, in an attempt to seize control. The heart of the plot originated at the Supreme Military Headquarters, the country’s biggest military airbase and in the army’s gendarmerie headquarters. The plotting wing of the army kidnapped most of the highest military commanders, including the Supreme Chief of the Armed Forces. They took control of the state radio, and the biggest private TV channels as well as the State television, from which they broadcasted a declaration announcing the take-over of political power against the illegitimate, corrupt and un-secular regime of Erdogan and the AKP. They declared a curfew and martial law, arguing in favor of a new Constitution. Erdogan’s plane was prevented from landing for hours. The President and Prime Minister both made appeals to the people to resist the coup attempt. Competing wings of the State machine were engaged in violent confrontations all through the night, with the police apparatus remaining largely loyal to Erdogan. Calls from the mosques were also issued to rally behind the government. A few thousand people, mostly right-wing Islamists and AKP core supporters, poured onto the streets as a result. Planes and helicopters from the army shot at demonstrations in the two main cities. By Saturday morning, more than 150 state forces on both sides and over 50 civilians had been killed. The majority of people and all political parties are opposed to a return to military rule, and most of the rank-and-file of the army are military conscripts who were not ready to line up behind the violence organized by the coup plotters and executioners. These are long-standing and entrenched privileged officers, interested in taking power for themselves. Hence the coup did not find the sufficient social and political base to be carried through. The main Turkish big business federation (TUSIAD) as well US imperialism speaking through the voice of President Obama, quickly made clear that they would not provide any backing to the plotters. As we have explained in previous material, a growing political crisis has emerged in Turkey and has intensified since last year’s elections in the context of a mounting crisis in the economy and narrowing social support for Erdogan’s regime. The AKP government has used the judiciary and military apparatuses to tide over this growing political deadlock, using the judicial system to suppress opposition voices inside and outside the Parliament, and using the army to crush Kurdish opposition. The ruling party’s attempt to force through a constitutional change towards a Presidential system is part of the same increasing Bonapartist tendency, to rule by this sole force. This repressive way of solving the political impasse has provided the tools that the coup plotters have turned against the AKP itself. While both sides have dressed up their goals behind the façade of democracy, both of them are only offering a variant of capitalist dictatorial rule over the majority, one in civilian clothes and the other in military uniform. These methods cannot solve the crisis gripping the country, but only exacerbate it, and will provoke bigger turmoil in the future. The recent coup plot has exposed the fact that the attempts to build a monolithic power have not only been unable to hide the growing internal fractures and feuds within the upper levels of the State; they have also encouraged them further. While it is of the utmost importance to resist Erdogan’s attacks on social and democratic rights, this coup illustrates that dictatorial rule cannot be fought with dictatorial top-down methods. Victorious or not, such a coup only means more repressive measures imposed on the masses. The failed coup will now be used by Erdogan to concentrate power further within his own trusted circle, and to clamp down further on democratic rights. This is already seen, with many public attorneys being arbitrarily removed from their posts and the intention of the government to reintroduce death penalty. These measures are presented to counter-act the military plotters, but will be conveniently in place to counter-act future struggles against the regime. The CWI and its section in Turkey, Sosyalist Alternatif, oppose the coup attempt, which helps Erdogan to reinforce his dictatorial agenda. Both camps represent different wings of the oppressive ruling class and need to be opposed. People’s resistance against any attempt at a military takeover cannot be left in the hands of the rotten regime of the AKP. Mass united action by the labour movement and the youth, the left and the HDP need to be built, independent from the ruling party’s staged mobilizations, which have occasionally used violence against political opponents and have no alternative to offer. The workers’ movement and the left need to urgently organize self-defense committees against the violence used by both sides. A third political pole around the working class, the poor and the youth needs to be built to stop the violence, all attacks on democratic and political rights, the State offensive against the Kurdish people, and the neo-liberal policies defended by both factions of the capitalist class. Long gone are the days when Turkey was praised as a model of prosperity and stability. The growing, multi-sided crisis engulfing Turkey is a reflection of the crisis of capitalism on a world scale. Only a struggle for socialist change, linked to workers’ solidarity in the Middle East, Europe and internationally, can put an end to the chaos and violence hitting Turkey at the moment.